Snow in the south is a rare thing. On January 28th and 29th, Macon, Georgia got 2 ½ – 4 inches of snow. Other cities across the southern United States got hit with the storm. Some school kids in Atlanta got stuck at school during the storm. Principal Mark Crowe of North Paulding High School in the Atlanta area said that they “…separated the boys and girls — the girls are in the auditorium [and] our boys are in the gym. We’ve got wrestling mats out for them and they’re kind of watching TV, playing basketball. We fixed dinner for them and we’ve had snacks for them. We’re showing some movies. They’re really doing a great job. We’ve got about 30 faculty members here who are helping us out and the students are doing great.” The kids may be doing great, but no driver in Atlanta is safe. 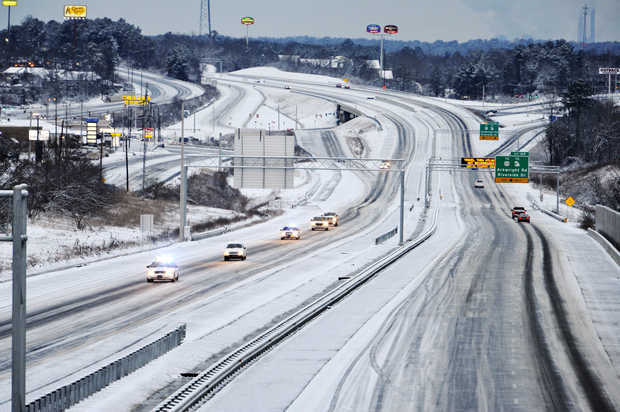 On GA 400 around 400 cars were abandoned as the drivers went to seek shelter. The snow also came with ice. I have talked to several people, who used to live in the north and drive in snow. “But people don’t understand…” one said, “We also get ice.” The ice is slippery and wet. Central Georgia kids are happy for the snow and a chance to build a snow man, but many adults are worried. As the snow melts, more drivers are getting on the roads and it is becoming safer. Still go about with caution. Interstates and highways were icy and slippery.